This is to inform that one of our poems 'Scrap Collector's Diary' has been featured in the Jan-Feb 2012 issue of Reading Hour Magazine. 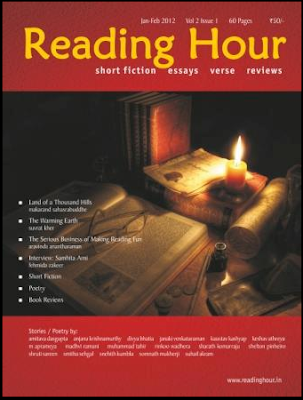 Reading Hour is a rare Indian literary magazine that features short fiction, essays, verse and reviews. Published on a bi-monthly basis, the magazine completed its first year in Jan 2012. They also presently pay a nominal amount and courier the magazine and payment to the contributors, which is a gracious and sensitive gesture.Considering all things, the Reading Hour people make quite a good work out of it. Wish more such Indian magazines provide us writers, poets and literary lovers with a common, converging outlet.